One of our top priorities is to maintain a healthy advertising ecosystem, and that means protecting people from misleading, inappropriate and harmful ads. We have teams of engineers, policy experts, product managers and others who wage a daily fight against bad actors. Over the years, this commitment has made the web a better place for our users—and a worse place for those who seek to abuse advertising systems for their own gain. Just last year alone, we took down more than 3.2 billion ads that violated our advertising policies—that’s more than 100 bad ads per second. When we see an increase in misleading or predatory behaviors in specific categories, we take additional action. For example, we’ve banned ads for payday loans and bail bonds services—and developed advanced verification programs to fight fraud in areas like local locksmith services and addiction treatment centers. Today, we’re taking another step. We’ve seen a rise in misleading ad experiences stemming from third-party technical support providers and have decided to beginrestricting ads in this category globally. For many years, we’ve consulted and worked with law enforcement and government agencies to address abuse in this area. As the fraudulent activity takes place off our platform, it’s increasingly difficult to separate the bad actors from the legitimate providers. That’s why in the coming months, we will roll out a verification program to ensure that only legitimate providers of third-party tech support can use our platform to reach consumers. These efforts alone won’t stop all bad actors trying to game our advertising systems, but it will make it a lot harder. There’s more to do, and we’ll continue committing the resources necessary to keep the online advertising ecosystem a safe place for everyone. This entry was posted in Inside AdWords and tagged AdWords, Google Ads on August 31, 2018 by Google Ads. This entry was posted in Research Blog and tagged Publications, Quantum AI, Quantum Computing, Research on August 31, 2018 by Google AI Blog. The Beta channel has been updated to 69.0.3497.73 (Platform version: 10895.40.0) for most Chrome OS devices. This build contains a number of bug fixes, security updates and feature enhancements. A list of changes can be found here. This entry was posted in Google Chrome Releases and tagged Beta updates, Chrome OS, Google Chrome on August 31, 2018 by Cindy Bayless. (8) ten3THealthcare: An early detection system for preventable clinical adverse events by monitoring real time, remote, and continuous vital signs of patients. This entry was posted in Google India Blog and tagged #startups #AI #ML, India on August 31, 2018 by A Googler. 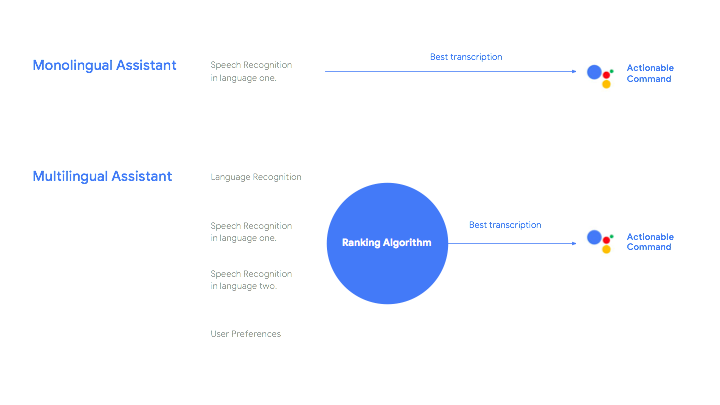 Your Google Assistant now understands and speaks more than one language at a time – and is becoming more useful with custom and scheduled routines. With the Google Assistant, it’s easy to get stuff done through a simple conversation – whether you’re looking for a delicious pumpkin soup recipe, setting a reminder to take the laundry off the line, or playing your favorite tunes. And starting today, the Assistant will become more helpful with two new capabilities: we’re adding multilingual support, so that the Assistant will be able to understand and speak more than one language at a time. Additionally, you can now set custom and scheduled routines on smartphones and speakers, making it easier to get things done quickly with your Assistant. Family members in bilingual homes often switch back and forth between languages, and now the Assistant can keep up. With our advancement in speech recognition, you can now speak two languages interchangeably with the Assistant on smart speakers and phones and the Assistant will respond in kind. This is a first-of-its-kind feature only available on the Assistant and is part of our multi-year effort to make your conversations with the Assistant more natural. 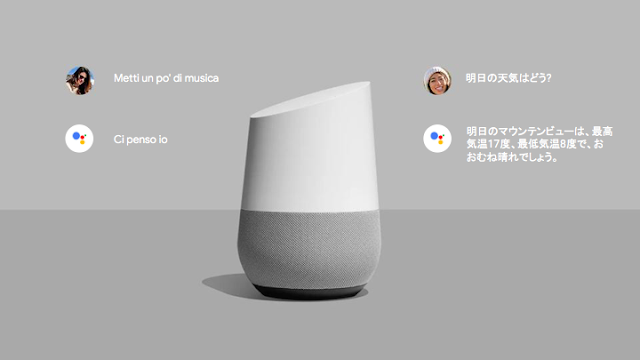 If you speak German at home, you can ask, “Hey Google, wie ist das Wetter heute?” And if you’re at a house party with friends, you can switch to English and say “Hey Google, play my BBQ playlist.” Currently, the Assistant can understand any pair of languages within English, German, French, Spanish, Italian, and Japanese. We’ll be expanding to more languages in the coming months. Your Assistant will now be able to help you manage your daily routines and get multiple things done with a single command. We’ve put together six Routines that help with your morning, commutes to and from work, and evening at home. For example, say “Hey Google, I’m home” and the Assistant on your Google Home or phone can turn on the lights, share any home reminders, play your favorite music and more, all with just four words. We’re also rolling out Custom Routines in Australia, which allow you to create your own Routine with any of the Google Assistant’s one million Actions, and start your routine with a phrase that feels best for you. For example, you can create a Custom Routine for family dinner, and kick it off by saying "Hey Google, dinner's ready" and the Assistant can turn on your favorite music, turn off the TV, and broadcast “dinner time!” to everyone in the house. And on Google Home devices, you can now schedule Custom Routines for a specific day or time through the settings of your Google Assistant. So if you’re keen to get back into a regular exercise routine, you can set up your workout routine to automatically kick off several times per week. We hope that these new features will make it even easier for you to get things done – even in multiple languages. This entry was posted in Australia Blog and tagged Australia on August 30, 2018 by Johnny Luu. At Google, many product teams use cryptographic techniques to protect user data. In cryptography, subtle mistakes can have serious consequences, and understanding how to implement cryptography correctly requires digesting decades' worth of academic literature. Needless to say, many developers don’t have time for that. To help our developers ship secure cryptographic code we’ve developed Tink—a multi-language, cross-platform cryptographic library. We believe in open source and want Tink to become a community project—thus Tink has been available on GitHub since the early days of the project, and it has already attracted several external contributors. At Google, Tink is already being used to secure data of many products such as AdMob, Google Pay, Google Assistant, Firebase, the Android Search App, etc. After nearly two years of development, today we’re excited to announce Tink 1.2.0, the first version that supports cloud, Android, iOS, and more! Tink aims to provide cryptographic APIs that are secure, easy to use correctly, and hard(er) to misuse. Tink is built on top of existing libraries such as BoringSSL and Java Cryptography Architecture, but includes countermeasures to many weaknesses in these libraries, which were discovered by Project Wycheproof, another project from our team. // 1. Generate the key material. // 2. Get the primitive. // 3. Use the primitive. Tink aims to eliminate as many potential misuses as possible. For example, if the underlying encryption mode requires nonces and nonce reuse makes it insecure, then Tink does not allow the user to pass nonces. Interfaces have security guarantees that must be satisfied by each primitive implementing the interface. This may exclude some encryption modes. Rather than adding them to existing interfaces and weakening the guarantees of the interface, it is possible to add new interfaces and describe the security guarantees appropriately. We’re cryptographers and security engineers working to improve Google’s product security, so we built Tink to make our job easier. Tink shows the claimed security properties (e.g., safe against chosen-ciphertext attacks) right in the interfaces, allowing security auditors and automated tools to quickly discover usages where the security guarantees don’t match the security requirements. Tink also isolates APIs for potentially dangerous operations (e.g., loading cleartext keys from disk), which allows discovering, restricting, monitoring and logging their usage. Tink provides support for key management, including key rotation and phasing out deprecated ciphers. For example, if a cryptographic primitive is found to be broken, you can switch to a different primitive by rotating keys, without changing or recompiling code. Tink is also extensible by design: it is easy to add a custom cryptographic scheme or an in-house key management system so that it works seamlessly with other parts of Tink. No part of Tink is hard to replace or remove. All components are composable, and can be selected and assembled in various combinations. For example, if you need only digital signatures, you can exclude symmetric key encryption components to minimize code size in your application. To get started, please check out our HOW-TO for Java, C++ and Obj-C. If you'd like to talk to the developers or get notified about project updates, you may want to subscribe to our mailing list. To join, simply send an empty email to tink-users+subscribe@googlegroups.com. You can also post your questions to StackOverflow, just remember to tag them with tink. We’re excited to share this with the community, and welcome your feedback! This entry was posted in Open Source Blog and tagged cryptography, Open source, open source release, releases, Security on August 30, 2018 by Open Source Programs Office. We’re making Google Forms look and work better when they’re embedded in websites created with Google Sites. These improvements will also mean Forms will work better embedded in websites not managed in Google Sites as well. Our users embed forms in sites for all sorts of reasons, from collecting customer feedback to capturing new project ideas to gathering and sharing survey data and much more. User feedback told us how important it was that these embedded forms look and work great, especially when embedded in Google Sites. This entry was posted in Apps Feed Blog and tagged apps, Editors, Google Forms, Rapid Release, Scheduled Release on August 30, 2018 by Jane Smith. This entry was posted in Research Blog and tagged machine learning, Natural Language Understanding, Research, Speech Recognition on August 30, 2018 by Google AI Blog. Editor’s note: On the anniversary of the first launch of the Space Shuttle Discovery, we’ll hear from Dr. Ellen R. Stofan, planetary geologist and the John and Adrienne Mars Director of the Smithsonian National Air and Space Museum, about a new 360 film on board the Shuttle that launched the Hubble Space Telescope. Since the dawn of spaceflight, only a few hundred people have experienced space firsthand. But since the beginning, there have been moments that captured the world’s imagination and challenged our collective Earth-bound perspective. Of the many orbital endeavors that have made headlines through the decades, one of the most enduring and prolific has been the Hubble Space Telescope. The Hubble has been called one of the most important single scientific instruments of all time. The data it collected has deepened our understanding of the natural world—from the edge of our solar system to the age of the universe—and the images it has returned have brought the startling beauty of the cosmos to people around the world. 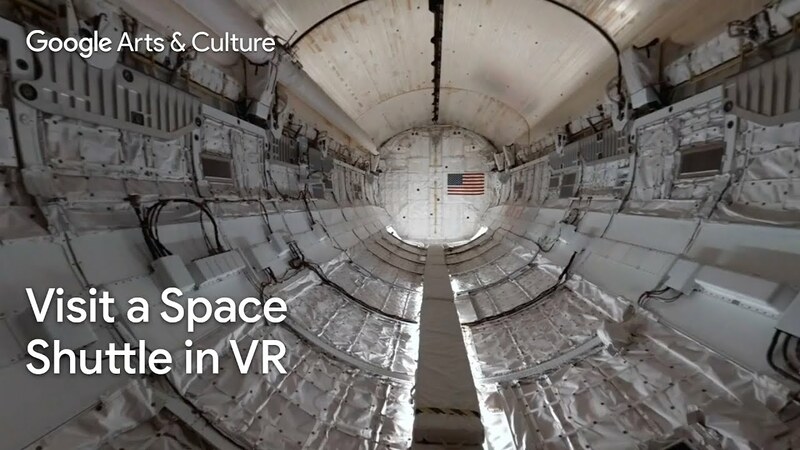 Today, on the 34th anniversary of the Space Shuttle Discovery’s maiden voyage, the Smithsonian’s National Air and Space Museum and Google Arts & Culture have teamed up to bring visitors into the orbiter like never before. Two of the astronauts who helped deliver Hubble to orbit as part of STS-31—Maj Gen Charlie Bolden and Dr. Kathy Sullivan—take us on a 360 journey inside Discovery at the Museum’s Steven F. Udvar-Hazy Center. The video was captured using Google’s Halo camera, and takes us along with the astronauts as they climb aboard the spacecraft together for the first time in 28 years. Charlie and Kathy show us what life in space was like from dawn (they saw 16 sunrises and sunsets each day) to dinnertime (sometimes eaten on the ceiling), and relive the moment they deployed Hubble after years of planning and training. STS-31 is just one great example of why Discovery was called the champion of the Shuttle fleet—and why it is now on display as part of the Smithsonian’s national collection. Discovery flew every kind of mission the Space Shuttle was designed to fly, from Hubble’s deployment to the delivery and assembly of International Space Station modules and more. Today, we’re celebrating the orbiter’s 39 missions and 365 total days in space with this special immersive film, 15 digital exhibits, virtual tours, and over 200 online artifacts. The space shuttle Discovery is the centerpiece of the James S. McDonnell Space Hangar at the National Air and Space Museum's Steven F. Udvar-Hazy Center in Chantilly, Va.
Gregory J. Harbaugh snapped this photo during the STS-82 crew's walk to service the Hubble Space Telescope. As we enter a new era of spaceflight in the years ahead—with NASA’s Commercial Crew Program and the development of Hubble’s successor, the James Webb Space Telescope—I hope this new collection demonstrates the remarkable progress we’ve made toward unlocking the mysteries of the universe, and how much farther we can go together. Explore the magic of Discovery Space Shuttle on Google Arts & Culture. This entry was posted in Official Google Blog and tagged Arts & Culture on August 30, 2018 by The Official Google Blog. This summer, we’ve brought the Google Assistant to more devices across Europe and the rest of the world to help you get answers and get things done in more languages (most recently supporting Spanish, Swedish and Dutch). At IFA 2018, we’re adding multilingual support, so that the Assistant will be able to understand and speak more than one language at a time. Additionally, we’ll be introducing new phones and a broad range of devices and appliances for the home that support the Assistant from our growing ecosystem of partners in Europe. If you’re looking for an answer in English, ask, “Hey Google, what’s the weather like today?” If you’re craving tunes from your favorite German hip hop band, just ask “Hey Google, spiele die Fantastischen Vier.” Currently, the Assistant can understand any pair of languages within English, German, French, Spanish, Italian, and Japanese. We’ll be expanding to more languages in the coming months. Listening to music is one of the most popular ways people use the Assistant. That’s why we built the Google Home Max to offer high-fidelity and balanced sound and now it's available in Germany, UK and France—Google Home Max will hit store shelves starting today. This week, we’re also announcing that the Assistant will be built into new voice-activated speakers, including the Bang & Olufsen’s Beosound 1 and Beosound 2, Blaupunkt’s PVA 100, Harman Kardon’s HK Citation series, Kygo’s Speaker B9-800, Polaroid’s Sam and Buddy and Marshall Acton II and Stanmore II. Expect these smart speakers and soundbars to roll out later this year in local European markets. On the heels of introducing our first ever Smart Displays last month with Lenovo, we’re expanding our offerings with the upcoming launch of JBL’s Link View and LG XBOOM AI ThinQ WK9 in the coming weeks. With these new Smart Displays, you’ll have the perfect kitchen companion. You can use your voice and tap or swipe the screen to follow along with a recipe, control your smart home, watch live TV on YouTube TV, and make video calls with Google Duo. Smart Displays also come integrated with all your favorite Google products services like Google Calendar, Google Maps, Google Photos and YouTube. The Assistant is also making your home even smarter. Just in the past year, there are now triple the number of home devices and appliances that work with the Assistant in Europe from all the major local brands you’re familiar with. Whether you speak German, French, English, Italian, Spanish, you’ll be able to set the temperature, lock the doors, dim the lights and more from a smart speaker and smartphone. The Google Assistant is expanding on more Android phones and headphones, helping you when you're on the go. Some of the latest flagship devices, including the LG G7 One, SHARP Simple Smartphone 4 and Vivo NEX S, now feature dedicated buttons to easily access the Assistant. In addition, the new Xperia XZ3 from Sony and Blackberry Key 2 LE also take advantage of the shortcuts to trigger the Assistant. And this week we're announcing that over the coming year, more headphones are on the way, including the JBL Everest GA and LG Tone Platinum, and Earin M-2. When you pair them to your phone, you can talk to the Assistant instantly with just a touch, whether you want to skip a track to hear the next song, get notifications, and respond to your messages, or set reminders. Phew, that was a lot of news. With lots of new devices and partners coming to Europe, the Google Assistant will be available to help you through every step of your day. This entry was posted in Official Google Blog and tagged Google Assistant on August 30, 2018 by The Official Google Blog.